The New York State Department of Health’s Population Health Improvement Program (PHIP) was designed to promote the Triple Aim – better care, better population health and lower health care costs – by supporting regional contractors to provide a neutral forum for identifying, sharing, and helping implement best practices and strategies to promote population health and reduce health care disparities in their respective regions. We are one of eleven lead organizations named by the state to work with community partners and stakeholders that impact, or are impacted by, health and health care issues. Community member involvement, perspective and community ties are key to the success of PHIP. 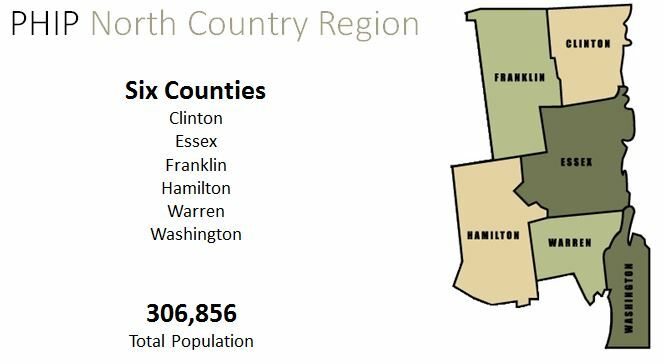 We continually seek interested regional participants to serve as partners and workgroups and committee members to help build a healthy future for our region. We support the identification and implementation of best practices and strategies by gathering, reviewing, and interpreting data in order to identify local needs. This data-driven effort will assist decision making in the region in order to promote population health and reduce health disparities. Visit the HealthyADK website for more information.